okay, before we start: the other day i got literally hundreds of hits on an old post from 2009 the other day. hundreds! i average about 150 hits a day…not 800! so this was quite unusual. i went back & looked at the post to see if there was anything especially incendiary or relevant in it, but it was just a boring “here’s what i did today” post. i couldn’t find anything in my (admittedly very low-tech) stats analysis software indicating where all these visitors were coming from or why. i can only assume the post was linked somewhere, but where, & more importantly, why? if anyone reading this can clue me in, i’d love to know. moving on! 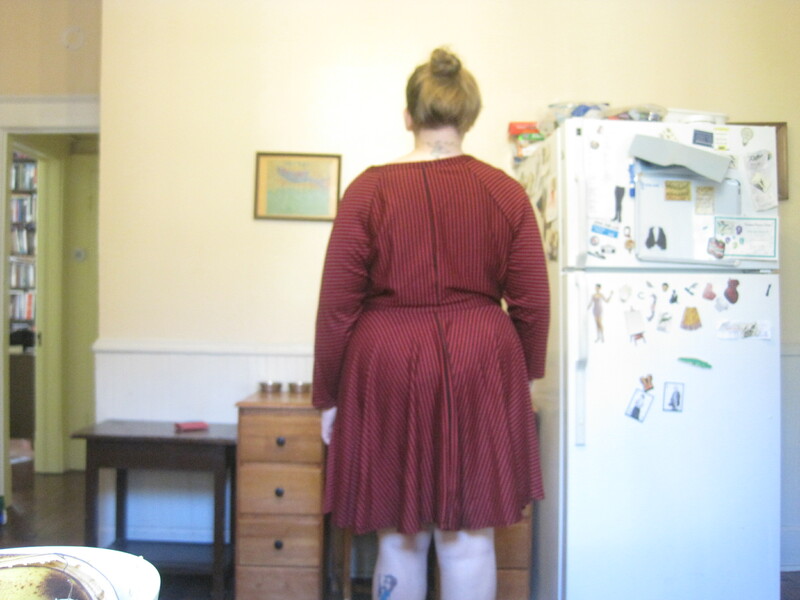 here’s a dress i made in august & have literally never worn. pattern: mccall’s 6754. fabric: some random striped ponte on sale for like $2 a yard at hancock fabrics. sorry these photos are kind of blurry, but honestly, the most beautiful photos in vhe world wouldn’t really help this dress. i made this pattern before, with short sleeves, from a blue floral jersey. (see here.) 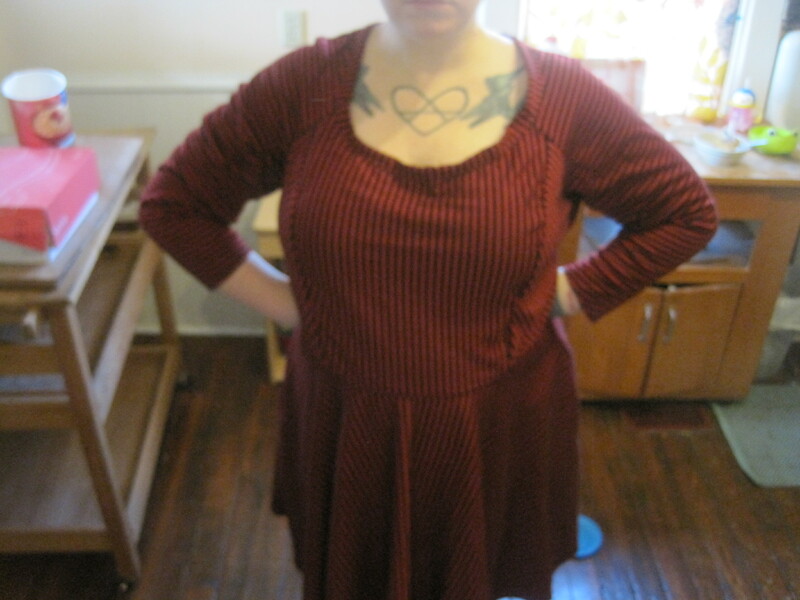 i didn’t love how that one came out either, for pretty much the same reasons: the neckline is way too big, & it came out kind of baggy under the bust. i wondered if it was just a question of the jersey being really stretchy & difficult to work with. like maybe i over-worked it & stretched it out too much. so i decided to try again with this fabric, which is a much heavier, more stable knit. oof. yes, i am standing up straight in this photo. my right hip is considerably higher than my left hip due to a weird misshapen vertebrae issue i was born with. you can really see it in this photo. i still don’t really know what alterations to make to try to correct for this. surprise: the sewing blogger community isn’t overrun with tutorials on how to do a “i’m so misshapen that maybe i should just give up & live in a french cathedral” adjustment. if you need an FBA though, they have got you covered. & to top it all off, the fabric i used is just subtly itchy. it seems okay when you first put it on, but then it slowly becomes more & more aggravating until you just want to tear all your skin off. oh, &, i pretty much never wear red. i don’t think it suits my coloring. so i really don’t even know why i bought this stuff. i must have just been hypnotized by the sale price. but guess what? even cheap fabric isn’t a bargain if you’re never gonna wear/use it! so you see why this languished in my closet for six months before i finally got around to writing up this post. it’s possible that the “too big” factor could just be a matter of built-in ease. but the dress i created doesn’t bear much similarity to the dresses on the models on the pattern envelope. maybe i made too big a size, maybe my alterations wrecked the design lines. who knows? at the end of the day, i doubt i will try this pattern again. i like a nice knit dress–especially in the summer (& note: the heavy knit & long sleeves makes this definitely NOT a summer dress, & makes the giant neckline even more impractical because how the hell am i supposed to layer under that cut?). but i’m not loving knit princess seams. i’ve really liked the way princess seams look on me in woven fabrics. but i don’t think this is working. so, all around, i’d call this one a fail. at least my hair looks nice in these photos. Previous Postthe flu & feminist parentingNext Postthere was william henry harrison. he died in thirty days! Yeah. If it’s that big, I’d go with drafting error on their part. Maybe they added too much ease? I hear you on the adjustments. Frances is such a bug to alter for, and there’s no tutorials out there for her body shape issues, either. And I’ve looked. It’s all just trial and error, isn’t it? well, i do kind of think the neckline is a drafting error. it is way, way, way too big. the pattern instructions say to fold the dress fabric in on itself & hem to make the neckline, but i made a separate neckline piece so as to lose any more fabric off the neckline. if it was any bigger, my bra would be on display! that is not at all what the technical drawings look like. like i said, maybe i chose a size too big. 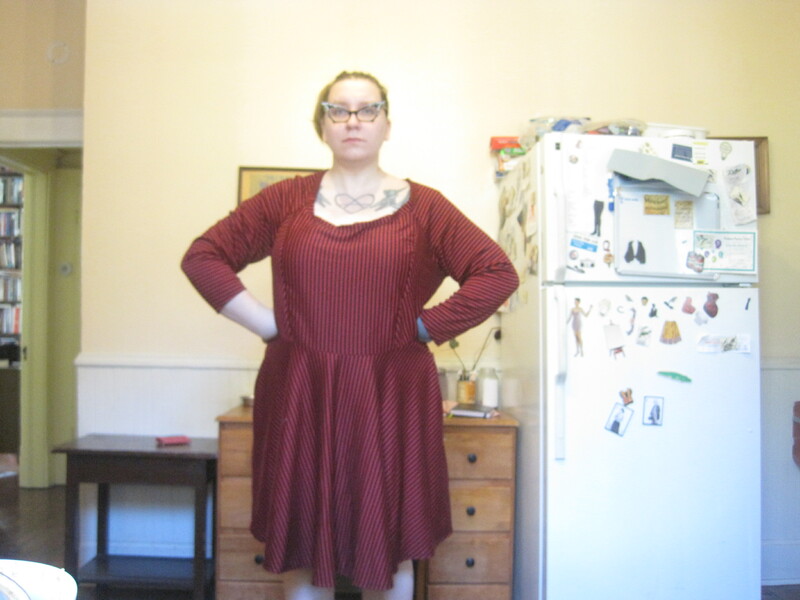 a google search tells me that many people found that the pattern runs way too big & the neckline is way too scooped. I think maybe the waistline hits you at an awkward spot? It doesn’t look awful on you, it just doesn’t look OMG awesome. i think the waist is maybe a little too big. i also made alterations to the waistline because mine is uneven (lower in the front than it is in the back), & i think i didn’t quite nail it. i agree that it’s not hideous-looking, but it’s such a compilation of minor fails that it ends up being practically unwearable in the end. at least it was a fairly quick sew. if you have to screw something up, a knit dress is a good way to go. maybe i will harvest the fabric to serve as a knit muslin, because i sincerely doubt i will ever wear this out of the house.